The Group Permissions are good for when you have a group of people you would like to provide the same permission to. If you select Permissions, you will see the below page. From here you will assign that groups permissions. Once assigned, make sure to Save All. Once permissions are assigned, click on Group Staff and from here you will add the staff to this group. If you select Staff, you will see the below page. From here you will assign the staff to this group. 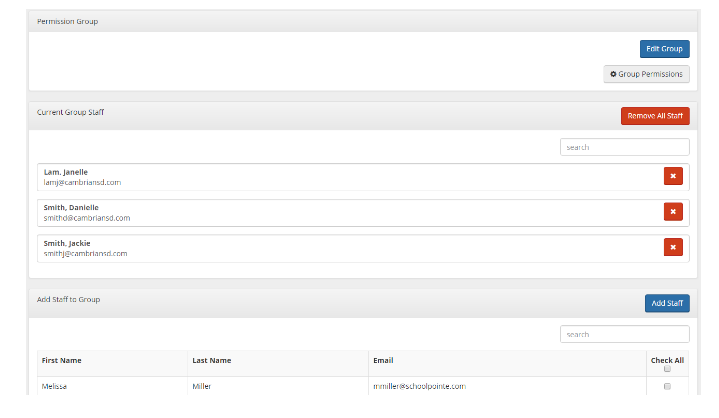 Once staff are assigned, click on Group Permissions and from here you will assign permissions to this group.